“Lighting Giants”, Pula’s new attraction, is a unique project in the world of lighting cranes of an operating shipyard. 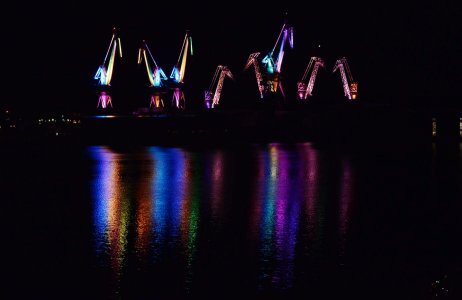 Dean Skira, the world-famous lighting designer, with the help of sponsors and workers of Uljanik Shipyard, has lit up the shipyard’s iconic cranes, a characteristic symbol of Pula. “Lighting Giants” have a sophisticated remote control system of lighting and scenography, and can be illuminated with 16 thousand different color combinations. You can enjoy this spectacular show and lighting display every evening from dusk until 10 pm, during the summer until midnight. There will be a different lighting scheme, specially programmed for special occasions, holidays and events.